Follow us to be notified about any upcoming positions! "I undertook a 6 month internship at Happythreads to gain some industry experience after finishing my degree in Creative Digital Media. During my time with Happythreads I was able to put into practice the skills I learned at college into real world scenarios. I gained an insight into what its like working for a fast paced, e-commerce company and learned a lot about digital marketing which I had no previous experience of - I even gained a Google Analytics Qualification! As part of my internship my duties included creating newsletter campaigns, designing graphics for the Happythreads website, adding new product lines to the site and running social media accounts. At Happythreads hard work really pays off, I am now a Digital Sales and Marketing Executive at the company and couldn't be happier." “I undertook my second year internship at Happythreads as a Digital Marketing Assistant. It was a really good experience both professionally and personally. I worked in the marketing department, the customer service office and the warehouse. I did some market research for a new business, managed social networks (Twitter, Pinterest, Instagram), worked on multi-channel selling (eBay, Amazon), discovered Google Analytics and all its tools etc. I had many diverse assignments, these helped me to learn a lot about managing an ecommerce website. I was also able to attend conferences in Google Headquarters in Dublin on subjects such as Google Adwords, Google Analytics and Youtube advertising. The Happythreads team were helpful and welcoming, they helped me in my missions, and to improve my English and they taught me a lot about Irish culture." "My internship at Happythreads as a Digital Marketing Assistant has been an incredible experience. I have gained various skills and know-how about digital marketing. During these three months of internship, I have discovered all of the aspects of how an e-commerce company works. I have worked in the Customer Service, in the Warehouse, in the After-Sales Services and in the Marketing Department. I have also taken courses to learn how manage company tools such as Google Analytics and Magento. Moreover, I have created studies and carried out reasearch for Happythreads. I have analyzed results, built graphs and put forward the outlook of developments to the team. I have also worked on the different social channels.This internship has been rewarding as the Happythreads team have welcomed me, helped me and encouraged me to progress. My internship was a complete learning experience, in a nice place, with an incredible team." "I have been working 3 months at Happythreads as a Digital Marketing Assistant, and it was a very nice experience. Everybody is very kind and helpful. I learned a lot of different things concerning Marketing, but also a company's organisation, the communication between the employees... and especially the functional of an Irish company (because I'm French and it was my first professional experience abroad). 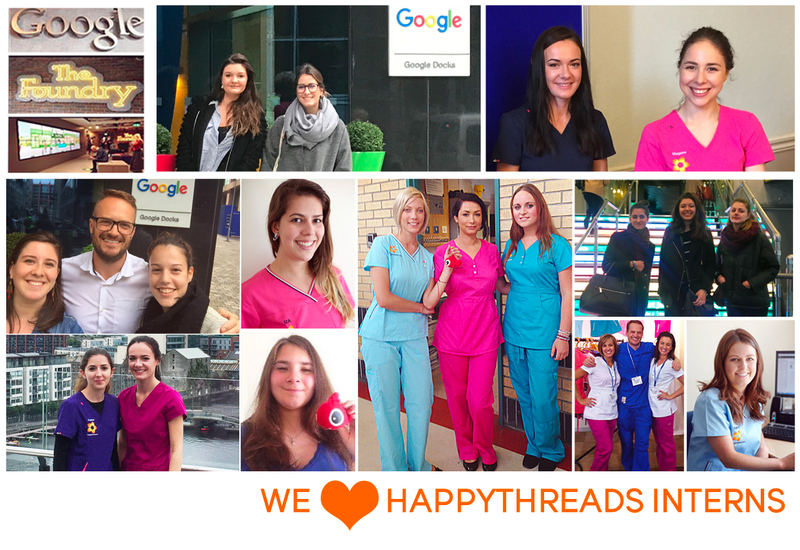 It was a real opportunity to work there and I recommend Happythreads for trainees who are looking for a rich professional experience." "The internship I undertook at Happythreads whilst studying for a postgraduate diploma in Digital Marketing provided a fantastic opportunity to break into a new industry and develop a strong skill-set in digital marketing with an eCommerce led organisation. Being able to take the theoretical learning and transform this immediately into real-life campaigns and strategies at Happythreads was without a doubt one of the key advantages of undertaking an internship in parallel with this course. This combination allowed me to quickly perfect and hone my practical skills and proved an advantageous selling point to employers when securing a permanent role on completion of my internship. Thanks again to all the team at Happythreads in particular Daniel the owner, for making this internship such a valuable learning opportunity"
"At my time at Happythreads I got a real understanding on the role of a Digital Marketing Manager, the rhythm & routine of the daily/weekly activities within a busy E-commerce Company and the importance Digital Marketing has to an Online Business Model. I gained invaluable experience in backend website content editing, was responsible for updating new catalogue ranges and refreshed price points for sale and promotional offers. I also got great experience in the functionalities required in setting up Facebook ads, Twitter ads & got my own Google AdWords account to set up and run my own Campaign. I was also very much included in the team from the beginning and found all I worked with extremely helpful and pleasant. My Internship at Happythreads has given me the practical knowledge that I require and allowed the theory I have learned to be put into practice, I can really see the value of this placement now as I Project Management my first live Digital Media Project. I would recommend this Internship to anyone seeking to gain valuable experience to help develop their skills in Digital Marketing." The internship in Digital Marketing offered by Happythreads was a unique experience. In 6 months, I’ve learned to manage two marketplaces eBay and Amazon, a bit of Facebook ad campaign, Google Analytics and participated to launch the new French website Happyblouse among other things. I had a lot of different and new things to do all along, this means that I was never bored with doing the same things over and over again. Working in a startup such as Happythreads was the opportunity to learn a lot about how an entire company works, as I’ve been able to work in the Customer Service, the Warehouse, and in the After-Sales Service. It was also full of amazing experiences such as attending trade shows, conferences in Google HQ, and so much more. Overall, I will never forget how much this internship has been incredibly positive for my professional and personal life. And a big thanks to the best colleagues I could have ever hoped for, there were always happy to help whenever it was needed. I undertook a 6 month internship as a digital marketing assistant at Happythreads to complete my second year of a master's degree in commerce. My tasks were both varied and interesting and I learned a lot about the management of an e-commerce company in development by working in different departments such as the marketing department, customer and management of the warehouse. I acquired knowledge related to social networks, Google Analytics, management of a website, Amazon, eBay and I could practice and improve my English. I also attended several conferences especially at the Headquarters of Google and had the chance to have courses of digital marketing. Thanks to the Happythreads team for their help. Emeline Pineau, Master’s degree in Management and International Commerce, Master 2 MCI (Management International Business) in La Rochelle. As a second-year student of modern languages, I had the opportunity to do my internship at Happythreads. In three months, I was able to learn the basics of e-commerce, by working in the customer service, inventory management, marketing department and on on the social networks. My tasks were always highly varied and really enriching. I particularly appreciated the atmosphere of the company, where the spirit of initiative and the autonomy are emphasised. I felt very well integrated into the team of Happythreads, with colleagues always ready to help and to listen. This work experience really allowed me to progress and to learn it more about e-commerce. I shall keep only good memories of my internship. I am a student in International Communication about to complete a master degree and I had the opportunity to do a 6 months internship in Happythreads. This internship taught me how to run an E-commerce website. I discovered a business sector that was unknown to me : Digital Marketing. I was in charge of the marketplaces, but in the meantime, I could develop my logistic and customer relation (customer service) abilities. Happythreads really care about the training process of its interns and is committed to equiping them with new skills. I was thus trained to use Google Analytics, I learned how to understand the challenges of Digital Marketing thanks to the Hubspot Academy online courses, and I also acquired Photoshop skills. 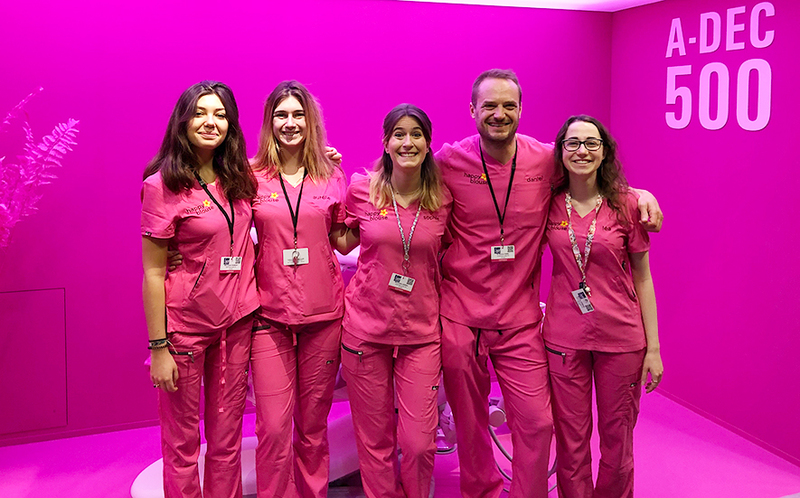 Kindness and solidarity are two of the most significant values in this company, and its amazing team generates a pleasant working environment that we are happy to find back in the morning and that is hard to part with at the end of the experience. During my 6 month internship as a Digital marketing intern at Happythreads, I had a great opportunity to gain competences in a wide range of subjects such as Digital marketing, taking care of eBay and Amazon marketplaces, managing different websites through the Magento platform, creating and posting content on social networks, dealing with Google Analytics, but also how to use advertising effectively on both Facebook and Instagram. Hence, this internship allowed me to develop useful skills in the field of communication, and also to work on my multicultural skills by working in a challenging international business environment. In this sense, I truly recommend this internship to all the students who want to learn new things every day. I would like to thank all the Happythreads’ team for their warm welcome, as well as for all the support that they give to their interns, and that I had the opportunity to leverage. "​Dans le cadre de mon année de césure, je n’aurai pas pu rêver d’un meilleur stage que celui effectué chez Happythreads pour une durée 6 mois. Issue d’une formation économique très théorique, ce fut l’occasion parfaite pour découvrir de manière concrète les rouages d’une entreprise de E-commerce en plein essor, et de comprendre les enjeux et en particulier ceux du digital qui lui incombent. J’ai eu l’occasion de participer activement à diverses tâches et missions (services clients, gestion des stocks, aide à la création d’un nouveau site internet, gestions des réseaux sociaux, créations de campagnes d’emailing, analyse de data...) responsabilisantes et permettant d’appréhender, de par leur diversité, l’importance de ces dernières. Toute l’équipe est également très à l’écoute, et a mis un point d’honneur à ce que j’apprenne et découvre des sujets qui m’intéressent. J’ai eu l’occasion de suivre les formations Google Analytics et Hubspot, d’assister à des conférences portant sur le Digital Marketing ainsi que d’apprendre à utiliser différents logiciels comme Photoshop. Je garde un excellent souvenir de ce stage, et de cette expérience qui, avec du recul, m’a apporté sur beaucoup de plans et remercie toute l’équipe Happythreads pour ces beaux moments!" "Mon stage chez Happythreads en tant que stagiaire en Marketing Digital a été une expérience formidable. En effet, j’ai pu acquérir des compétences et savoir-faires très variés. Pendant trois mois de stage, j’ai eu la chance de découvrir tous les aspects d’une entreprise. J’ai travaillé à l’entrepôt, au service client, au service après vente et surtout au service Marketing. Ainsi, J’ai suivi des cours pour apprendre à gérer des outils d’entreprise tels que Google Analytics ou encore Magento. Également, j’ai mené des études et effectué des recherches pour Happythreads. J’ai étudié les résultats, construit des graphiques permettant de mettre en évidence les perspectives d’évolution. J’ai véritablement mis en pratique mes connaissances scolaires. J’ai enfin eu l’occasion de travailler sur différents réseaux sociaux. Ce stage n’aurait pas pu être aussi enrichissant sans toute l’équipe Happythreads, qui m’a accueilli, aidé, et sans qui je n’aurais jamais autant progressé. Un apprentissage complet, dans un cadre agréable et avec une équipe sympathique, constituent le cocktail parfait pour un stage réussi, et une expérience professionnelle véritablement constructive." "J’ai effectué mon stage de 2è année à Dublin au sein de l’entreprise Happythreads, distributeur d’uniformes médicaux en Irlande et au Royaume-Uni. Ce stage a été très gratifiant, car en tant qu’Assistante en Marketing Digital, j’ai eu la chance de faire des missions passionnantes et très variées. De plus, j’ai eu l’opportunité d’améliorer mon anglais, et de découvrir une autre culture. Je recommande fortement aux étudiants passionnés par le digital de rejoindre l’équipe de Happythreads." "J’ai réalisé mon stage de deuxieme année à Happythreads en tant qu'Assistante en Marketing Digital. Ce fut une très bonne expérience tant professionnelle que personnelle. J’ai pu travailler au service marketing, au service client et dans l'entrepôt. J’ai réalisé des études de marchés, géré les réseaux sociaux (Twitter, Instagram, Pinterest), travaillé sur les marketplace, découvert Google Analytics et tous ses outils etc. Mes missions étaient polyvalentes, cela m’a permit d’en apprendre beaucoup sur la gestion d’un site d’e-commerce. J’ai aussi eu la chance d’assister à des conferences sur Google AdWords, Youtube, Google Analytics, dans les locaux de Google à Dublin. J’ai ete tres bien accueilli par l'équipe d’Happythreads, ils m’ont beaucoup aide dans la réussite de mes missions et à progresser sur mon anglais, ainsi que sur la culture irlandaise." Mon stage dans le digital marketing à HappyThreads a été une expérience unique ! En 6 mois, j'ai appris à gérer seule les plateformes marketplace Ebay et amazone, gérer des campagnes Facebook Ads, analyser des statistiques sur Google Analytics et participer au lancement du nouveau site internet Français Happy Blouse. J'ai eu des tâches très polyvalentes tout au long de ce stage, ce qui m'a permis de ne jamais m'ennuyer. Travailler dans une start-up comme HappyThreads a été l'opportunité pour moi d'apprendre beaucoup sur comment une entreprise fonctionnait. J'ai pu travailler au service client, dans l'entrepôt où nous rangeons les articles, aux services après-ventes. Ce stage a été aussi remplie d'expériences étonnantes comme participer à des salons professionnels, des conférences au siège de Google et plein d'autres choses encore. Pour finir, je n'oublierais jamais à quel point ce stage a été positif pour moi que ce soit dans ma vie professionnelle et personnelle. Et un très grand merci a mes super collègues, je ne pouvais pas espérer mieux comme compagnie. Toujours heureux et joyeux de m'aider quand j'avais besoin d'aide. J’ai effectué un stage de 6 mois comme assistante marketing digital à Happythreads pour compléter ma deuxième année de master en commerce. Mes missions étaient variées et j’ai beaucoup appris sur le fonctionnement d’une entreprise d’e-commerce en développement en passant par le service marketing, client et management de l’entrepôt. J’ai acquis des connaissances reliées aux réseaux sociaux, Google Analytics, management d’un site internet, Amazon, eBay et j’ai pu améliorer mon anglais. J’ai aussi participé à de nombreuses conférences notamment au siège de Google et eu la chance d’avoir des cours de marketing digital. Je remercie l’équipe d’Happythreads pour son aide. Etudiante en deuxième année de Langues étrangères appliquées, j’ai eu l’opportunité d’effectuer mon stage de 2ème année chez Happythreads. En trois mois, j’ai pu y apprendre les bases du commerce en ligne, en travaillant au service clients, à la gestion des stocks, au service marketing ou encore sur les réseaux sociaux. Mes missions étaient toujours très variées et réellement enrichissantes. J’ai particulièrement apprécié l’ambiance de l’entreprise, où l’esprit d’initiative et l’autonomie sont mis en valeur. Humainement, je me suis sentie très bien intégrée dans l’équipe d’Happythreads, avec des collègues toujours prêts à aider et à écouter. Cette expérience professionnelle m’a réellement permis de progresser et d’en apprendre plus sur le e-commerce. Je n’en garderai que de bons souvenirs. Mon stage de 6 mois chez Happythreads en tant que stagiaire en Marketing Digital m’a beaucoup apporté. J’ai ainsi pu développer de nouvelles compétences dans plusieurs domaines. En effet, j’ai eu la chance d’apprendre au sein des différents pôles de l’entreprise : au service Marketing, au service client, au service après vente ainsi qu’à l’entrepôt. De plus, j’ai eu la chance de suivre une formation Google Analytics ainsi que Google Hubspot. Cette entreprise à taille humaine permet aux stagiaires d’avoir de réelles responsabilités et d’être polyvalents. Je remercie toute l’équipe pour leur accueil ainsi que leur aide apportée pour m’aider à réaliser les missions confiées et je recommande vivement ce stage à d’autres étudiants qui souhaitent apprendre de nouvelles choses tous les jours. l’entreprise. J’ai particulièrement aimé la gestion des réseaux sociaux et d’amazon, ce qui permet aux étudiant de voir l’autre coté de ces plateformes, le coté ou nous sommes le vendeur. Ce stage a été enrichissant sur le point professionnel mais aussi personnel car j’ai pu cotoyer pendant 6 mois une équipe tout simplement incroyable. Etudiante en Master Communication internationale j’ai eu l’opportunité d’effectuer un stage de 6 mois au sein d’Happythreads au cours duquel j’ai pu découvrir et participer au fonctionnement d’un site de e-commerce. J’ai découvert un domaine d’activité qui m’était encore inconnu: le marketing digital. En charge des marketplaces, j’ai également pu développer mes compétences en logistique et relation client. Happythreads a à coeur de prendre part au processus de formation de ses stagiaires en leur apportant de nouvelles compétences. C’est ainsi que j’ai pu être formée à l’utilisation de Google Analytics, comprendre les enjeux du marketing digital grâce aux formations Hubspot Academy et développer mon savoir-faire sur Photoshop. La bienveillance et l’entre-aide sont deux valeurs essentielles à l’entreprise et sa formidable équipe qui crée un environnement de travail qu’on a plaisir à retrouver chaque matin et qu’il est difficile de quitter.